While looking for autumn recipes to experiment with we were determined to find ones that are less “expected.” Apple Pies and Crisps need not apply. So, when we found this recipe on Smitten Kitchen we decided we had to try it. 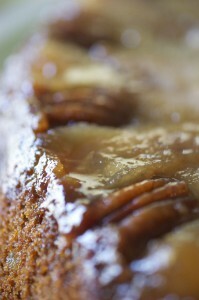 The flavors were a nice twist on the expected autumn palette of ginger, apples, and caramel. Deciding that the original recipe was delicious but not quite “us” we tweaked it a bit. We kicked up the ginger flavor in the recipe by adding crystallized ginger to the cake for an extra bite, roasting pecans to add to the top (or bottom, depending on your perspective), and mixing vanilla into the caramel… because quite frankly we were surprised it didn’t call for this essential ingredient and felt the caramel flavor in the original was just a little flat. When assembling the apples and pecans in the pan, remember you want the “top” of your design to be face down. This step is essential to how you want your finished cake to look. Be creative with your apples and pecans to make nice designs. The results were superb! The crystallized ginger is optional in this recipe but adds a great complexity to the taste, so you can decide how adventurous you are feeling – and of course enjoy! Preheat the oven to 325°F. Grease a 10-inch cake pan or cast iron skillet. Melt butter in a small saucepan. Add brown sugar and simmer over moderate heat, stirring, four minutes. Remove from heat and swirl in salt and vanilla. Pour into the bottom of your cake pan or skillet. 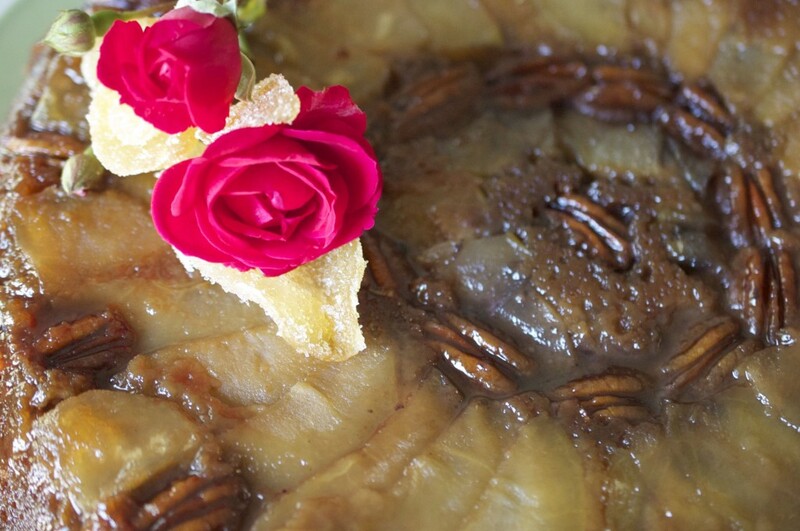 Make circles of overlapping apple slices and pecans on top of the caramel. 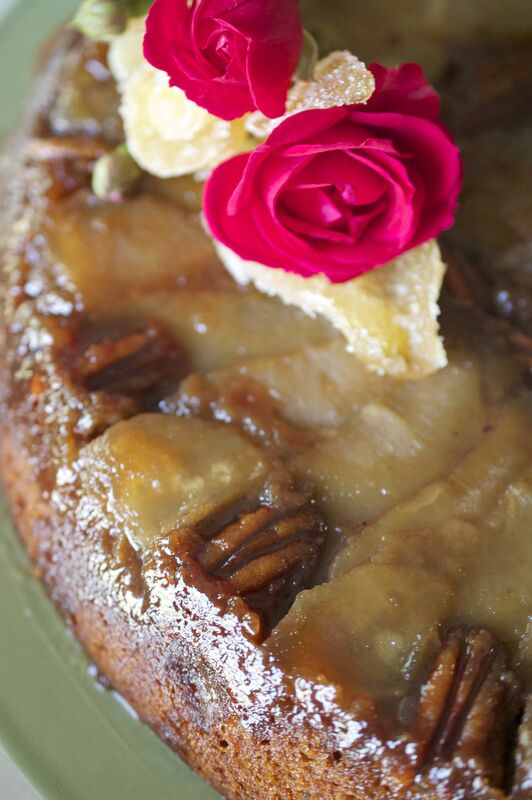 Once pan is filled with the apples and pecans, chop any remaining slices and place them in the gaps. Using a mixer, blend ½ cup butter and the sugar on medium-low speed. Increase the speed to high and cream until light and fluffy. In a medium bowl, whisk together the egg, molasses, honey and buttermilk. In a separate bowl, sift together the flour, baking soda, salt, ground ginger and cinnamon. Alternate mixing the flour and molasses mixtures into the butter mixture, adding the next once the last has been incorporated. Fold in crystallized ginger, do not over-mix. Pour the batter into the pan or skillet. Bake at least 45 to 50 minutes or until a wooden tester inserted into the center of the cake comes out clean. Let cool on a rack for 10 to 15 minutes, then turn out onto a platter.